Ahsapa is a water control structure named to honor the area’s early Native American inhabitants, that provides The Nature Conservancy’s (TNC) Emiquon Preserve a path to the Illinois River. 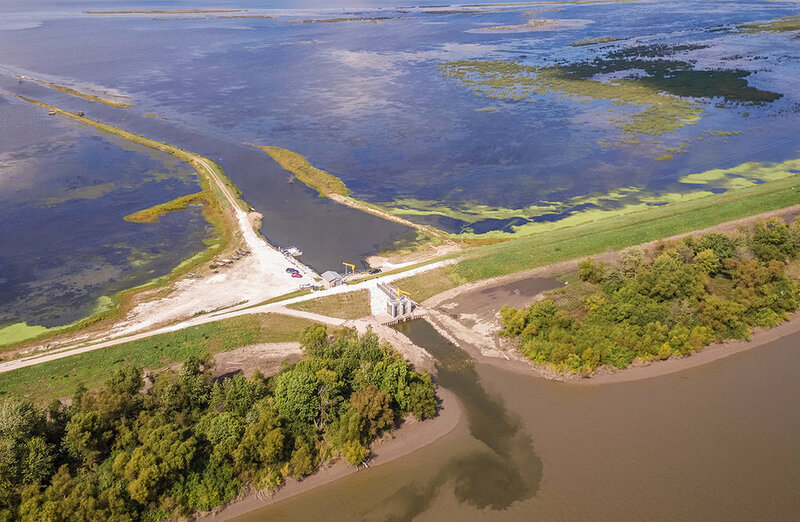 Maurer-Stutz, Inc. (MSI) and Hanson Professional Services Inc. teamed up to tackle the design and project management for the structure that reconnects one of North America’s largest floodplain restoration projects of 5,500-acres of wetland to the Illinois River near Havana, IL. From what was once floodplain turned farmland is now being restored to floodplain. The structure provides drainage and flood control for agricultural land and infrastructure, water-level management between the floodplain and the river, control of sediment and fish and opportunities for scientific research. A key feature of Ahsapa is that it allows water-level fluctuation that in-turn benefits aquatic species and waterfowl, as well as protects the preserve from degradation. Emiquon will be able to give future generations a glimpse into what the early explorer, Pere Marquette, saw as he traveled the Illinois River Valley. Maurer-Stutz served as the project manager and main point of contact with TNC. MSI completed design, plans and specifications for the pump station and control building, developed bid documents, and facilitated bid review and contractor selection. Finally, MSI led construction observation efforts as the engineer of record. Hanson provided complete design services, plans and specifications for the water control structure, as well as foundation design of the pump station and control building. Both firms worked closely with TNC to design the unique project, a multipurpose, gated water control structure; a pump station; and an elevated control building. Ahsapa exemplifies how science-based organizations and engineers can unite to create a more sustainable, effective and useful approach to traditional infrastructure. On September 26, 2018, at the 94th Annual American Society of Civil Engineers (ASCE) Central Illinois Section Meeting and Banquet in Springfield, IL, Ahsapa received the Project of the Year Award. This marks the third major award since its construction. It has received an Honor Award from the American Council of Engineering Companies (ACEC) of Illinois, a National Recognition Award from ACEC and the Award of Excellence from the Association of Conservation Engineers’ Carl V. Anderson Conservation Project Awards. To learn more about The Nature Conservancy, visit www.nature.org or follow @nature_org on Twitter.